Trigger-point dry needling is an invasive procedure where a fine needle or acupuncture needle is inserted into the skin and muscle. It is aimed at myofascial trigger points (MTrP) which are hyperirritable spots in skeletal muscle that are associated with a hypersensitive palpable nodule in a taut band. Trigger point dry needling can be carried out at superficial or deep tissue level. This was developed by Peter Baldry. He recommended the insertion of needles to 5-10mm over a MTrP for 30 secs. Palpation of the MTrP then determined the level of response and whether needle stimulation was sufficient to alleviate MTrP pain. If not the need was re-inserted. The trigger point model is a dry needling technique that specifically targets myofascial trigger points. They are thought to be due to an excessive release of acetylcholine from selected motor endplates. They can be divided into Active and Latent myofascial trigger points. Active trigger points can spontaneously trigger local or referred pain. They cause muscle weakness, restricted ROM and autonomic phenomena. Latent trigger points do not cause pain unless they are stimulated. They may alter muscle activation patterns and contribute to restricted ROM. Therefore both active and latent trigger points cause allodynia at the trigger point site and hyperalgesia away from the trigger point following applied pressure. The formation of trigger points is caused by the creation of a taut band within the muscle. This band is caused by excessive acetylcholine release from the motor endplate combined with inhibition of acetylcholine esterase and upregulation of nicotinic acetylcholine receptors. Initially taut bands are produced as a normal protective, physiological measure in the presence of actual or potential muscle damage. They are thought to occur in response to unaccustomed eccentric or concentric loading, sustained postures and repetitive low load stress. However when sustained they contribute to sustained pain. Pain caused by trigger points is due to hypoxia and decreased bloodflow within the trigger point. This leads to a decreased pH which activates the muscle nociceptors to restore homeostasis. This causes peripheral sensitization. Trigger points are also involved in central sensitization. The mechanism remains unclear but trigger points maintain nocioceptive input into the dorsal horn and therefore contribute to central sensitization. The needle may cause a small focal lesion which triggers satellite cell migration to the area which repair or replace damaged myofibers. This occurs 7-10 days after dry needling. It is unclear whether continued dry needling within this period may disrupt this process. This stretch may allow sarcomeres to resume their resting length. The mechanical pressure causes collagen fibers to intrinsically electrically polarize which triggers tissue remodelling. In a patient with needle fobia. Patient unwillng - fear, patient belief. Unable to give consent - communication, cognitive, age-related factors. Over an area or limb with lymphedema as this may increase the risk of infection/cellulitis and the difficulty of fighting the infection if one should occur. The effectiveness of this treatment depends greatly on the skill of the therapist to accurately palpate mysofascial trigger points as well as kinaesthetic awareness of the anatomical structures. - A cochrane review (2005) of RCTs concluded that trigger point dry needling may be beneficial for low back pain when used in combination with other treatments. However further higher quality studies are needed to confirm this. - It is suggested that dry-needling reduces/removes nociceptive input from trigger points, normalize synaptic efficacy and reduce peripheral and central sensitization. - Dry-needling can restore muscle activation and strength as well as ROM. - Dry-needling decreases pain in patients with Chronic low back pain and in patients with hemiparetic upper limb post CVA. - A systematic review of 23 trials considering needling therapies for myofascial trigger point pain concluded that direct dry-needling (where MTrPs were directly targetted) was as benificial as wet needling. There is no clear evidence that it is beneficial above placebo. More studies of higher quality with a reproducible diagnostic criteria and a valid placebo are needed to draw firm conclusions on this. Very low–quality to moderate quality evidence suggests that dry needling performed by physical therapists is more effective than no treatment, sham dry needling, and other treatments for reducing pain and improving pressure pain threshold in patients presenting with musculoskeletal pain in the immediate to 12-week follow-up period. Low-quality evidence suggests superior outcomes with dry needling for functional outcomes when compared to no treatment or sham needling. No difference in functional outcomes exists when compared to other physical therapy treatments. Evidence of long-term benefit of dry needling is currently lacking. ↑ Ga H, Choi JH, Park CH, Yoon HJ. Dry needling of trigger points with and without paraspinal needling in myofascial pain syndromes in elderly patients. J Altern Complement Med. 2007; 13: 617– 624. ↑ Chen JT, Chung KC, Hou CR, Kuan TS, Chen SM, Hong CZ. Inhibitory effect of dry needling on the spontaneous electrical activity recorded from myofascial trigger spots of rabbit skeletal muscle. Am J Phys Med Rehabil 2001; 80: 729–35. ↑ Australian Society of Acupunture Physioterapists Inc. Guidelines for safe acupuncture and dry needling practice, 2007. ↑ White, A., Cummings M., Filshie, J. Evidence of safety of acupuncture. An introduction to Western medical acupuncture. Edinburgh: Churchill Livingstone, 2008. ↑ Furlan AD, van Tulder MW, Cherkin D, Tsukayama H, Lao L, Koes BW, Berman BM. 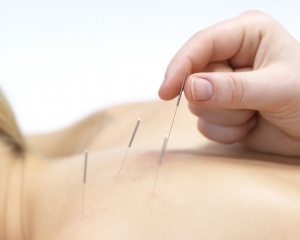 Acupuncture and dry-needling for low back pain. Cochrane Database of Systematic Reviews 2005, Issue 1. ↑ Gattie E, Cleland JA, Snodgrass S. The effectiveness of trigger point dry needling for musculoskeletal conditions by physical therapists: a systematic review and meta-analysis. journal of orthopaedic & sports physical therapy. 2017 Mar;47(3):133-49.